It’s been forever since I’ve done a recipe, right? I often talk about Zoodles on my twitter, as they’re my favies. So – here goes! 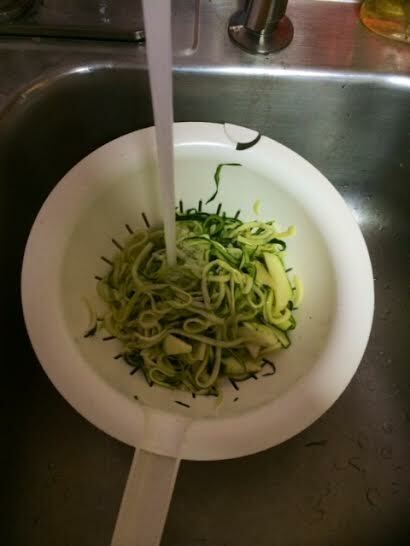 Zoodle Maker is neccessary and the best cheap kitchen gadget money I’ve spent in a hot minute. 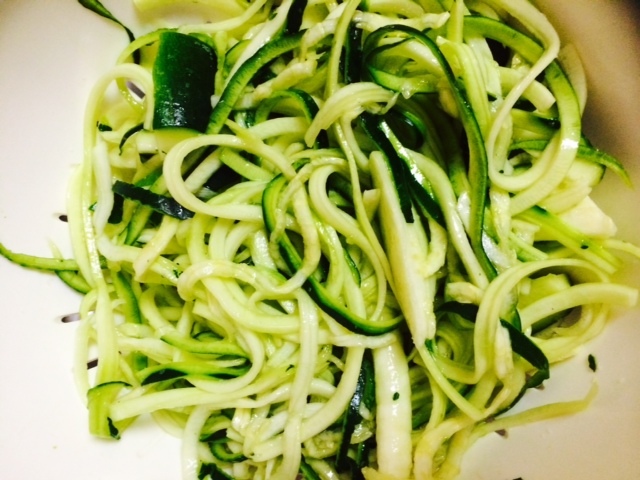 Zoodles replace my pasta! I will say, please – for the love of God – follow my recipe, or any zoodle recipe for success though. If not, you end up with zucchini mush, and the only place for zucchini mush is in my trash or covered in cheese…because anything covered in cheese is delish. Okay – get your fancy schmancy Zoodle Maker and a couple of zucchinis and get ready to get down to business. 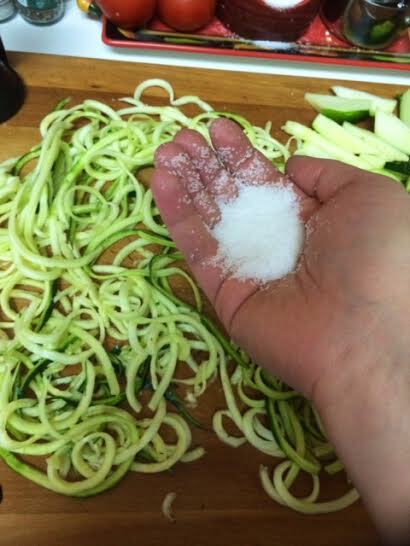 Cut the ends off of your zucchini, insert and twist. Now, I’m OCD and go through my strands and break them into what I feel are appropriate lengths. You don’t have such desire, whatever. You don’t know my life. Now, grab your container of Kosher Salt and get ready to go to town. Seriously DO NOT SKIP THIS STEP. This is called “sweating” the zucchini. 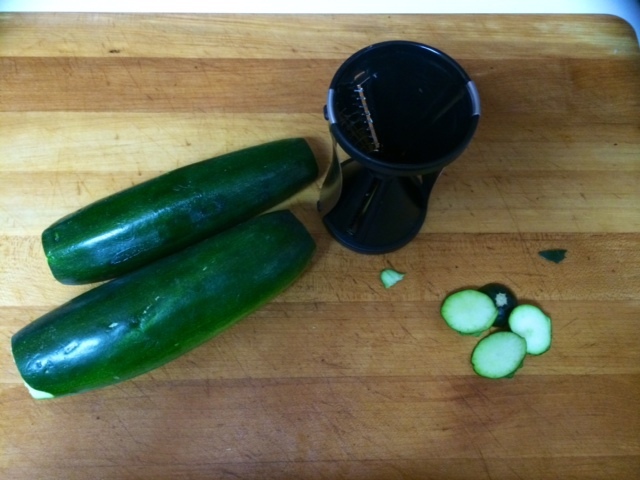 You basically want to dehydrate it as much as possible so that you don’t have a plate of watery zucchini. No worries, Sodium Police, we’ll rinse most of the salt off anyhow. Ok – get nasty with it. I did that amount below THREE times. Toss it in a colandar so it can drain and leave it alone for 20 minutes. You will actually be able to see the moisture come out of the zucchini and you’ll be amazed by it. Or at least I am…every single time. If you click on the left you can see how wet the zucchini is. After your TWENTY MINUTE timer has gone off rinse the hell out of your zucchini and then pat it dry with a paper towel. 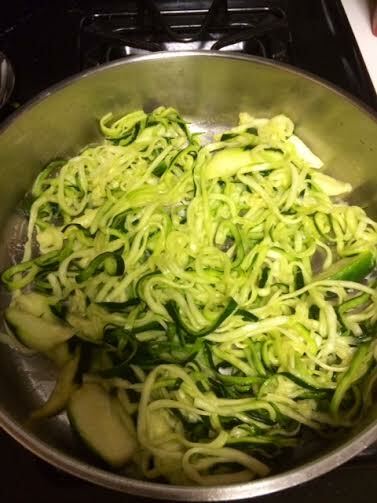 While you’re patting your zoodles dry crank your heat up in a pan and either hit with some cooking spray or a tsp of olive oil. You don’t need much – just enough to prevent the initial shock and stick. Let it go for 4 minutes. Seriously, 4 minutes. Not 5 or 6. Unless you have a bowl of cheese ready for your mush. Stir it every 30 seconds or so to prevent the stickage. While that’s going figure out what sauce you want on it. Last night, I was feeling particularly lazy so I bought two Chicken Parm Cutlets from The Fresh Market, some Arrabiatta (spicy spaghetti) sauce, rolls, and salad. 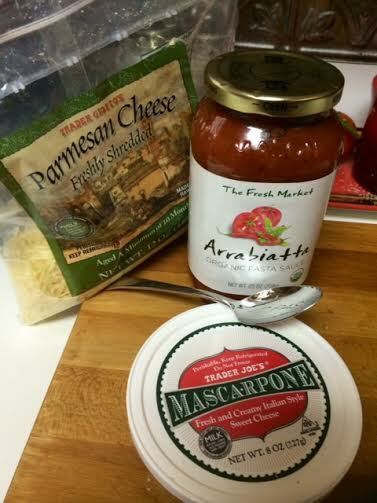 I like a dollop of mascarpone cheese in it, too. Once your noodles are done toss your sauce in it, stir, and serve. 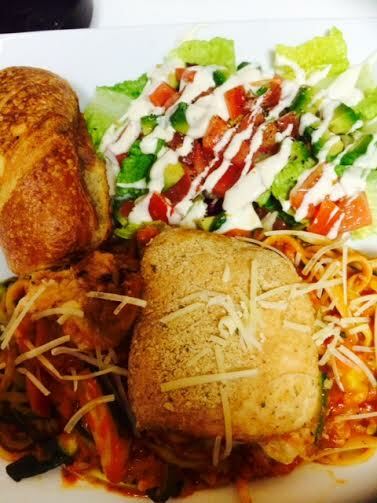 Hey – I saved the carbs on the pasta, so didn’t feel bad about indulging with the roll. A little tomato and avocado on the salad – yum – heaven. So, SRSLY GUIS! GO BUY A ZOODLE MAKER IF YOU DON’T OWN ONE!!! Can these be leftovers, or is it like, eat these NAU or they become mushy poison? Yay! 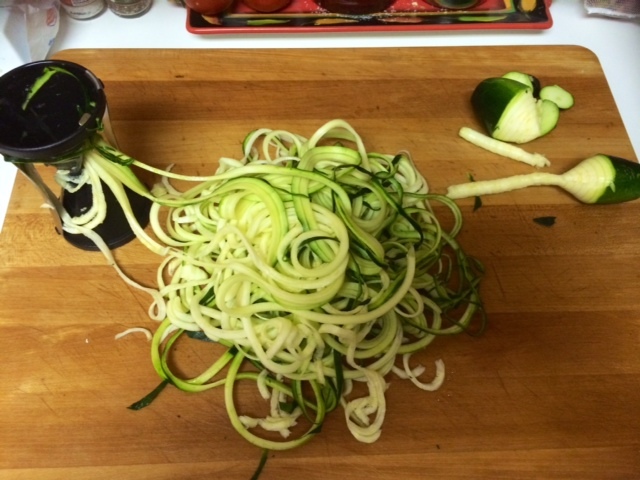 I loooove my zoodles!